Another rumor…yuck. 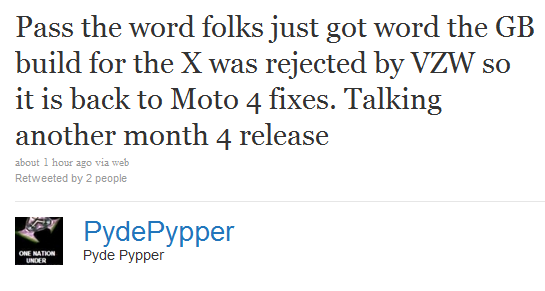 So a Twitter user named PydePypper, has apparently heard that Gingerbread for the DROID X was rejected by Verizon just after Motorola approved it. This comes almost a day after we heard that there was a chance the update would start rolling out Sunday; who knows at this point. We have been unable to get further confirmation on it actually going down this weekend, so to be safe, we’ll just have to tell you all to not expect anything any time soon. We were unbelievably surprised to learn that it could have been released this weekend, and are definitely not holding out hope at this point. It just seems way too soon. Instead, let’s talk about the Motorola XOOM Wi-Fi that officially becomes available on Sunday! And from a quick look around the blogosphere, it appears as if everyone is taking our advice and heading into Staples to grab one early. Nice.